For those who don’t know, I have a couple of day jobs. 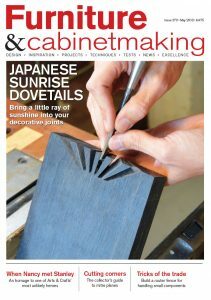 The first and the one that occupies most of my time is the Editor of Furniture & Cabinetmaking magazine. F&C is based in the UK with a readership that spans at least five continents. As the title suggests we cover all that is best in the world of furniture and cabinetmaking with regular features chosen to inspire and educate with techniques chosen to help you improve your general woodworking knowledge. While I’m happy to answer queries about the content in F&C and steer readers in the direction of their nearest stockist etc. this blog is not linked to the magazine. You can find out more about F&C and take out a subscription to practically anywhere in the world here. When I’m not editing the magazine I can be found at London Design & Engineering UTC where I provide technical support to the staff and students. 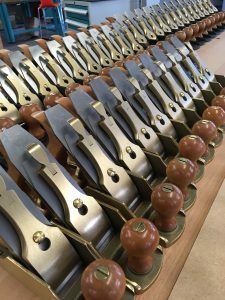 The school has the best equipped hand tool woodworking workshop in the UK for students aged between 14 and 19. It’s kitted out with all the tools that professional cabinetmakers would use and is the perfect environment to encourage the next generation of furniture makers. We’ve found that even the most inexperienced students get great results the first time they use a premium tool from the likes of Lie Nielsen, Veritas and Bad Axe. Our custom-made benches have been designed to accommodate two students at a time comfortably and have wide quick release vises and hold fasts. There are even benches and tools for lefties. LDE is on the Docklands Light Railway opposite London City Airport just a few stops down from Excel. There are plenty of hotels in the vicinity. Later this year we will be launching classes that will be open to the public. You can book them here and an apprenticeship programme for furniture making. Make sure you visit these two enterprises. They’re both committed to promoting the craft and worth getting to know.